Being at the forefront of the guitar-driven indie rock scene for over 20 years, Built to Spill have cemented their reputation with a lot of hard work. With a string of superlative albums, first-rate musicianship and songcraft, and seemingly nonstop touring, it’s very well deserved. After a few personnel changes as of late, frontman Doug Martsch and company have just released their newest disc, the lauded ‘Untethered Moon‘, and are back on the road to support it. Being almost exactly a year since I last saw the band, I was very excited not only to see them perform again but to also catch my first concert in Charleston and at the famed Music Farm. Known for wearing their influences on their sleeves by way of an extensive list of cover songs, the group dialed it back a bit for this outing and focused primarily on their own material, including a handful of tracks from the new album. The exception being a 14+ minute workout of Neil Young’s “Cowgirl in the Sand”, streaming below. It’s the surprises like this that keep reminding you how Built to Spill stays at the peak of their game. Set up dead center and right in front of the board, we couldn’t have asked for a better location to record from. And with the band’s soundman, Ian, at the helm with assistance from the venue’s FOH, Mike, the sound was excellent. We hope you like what you hear as much as we did. Enjoy! If you download this recording, we expect that you will PLEASE SUPPORT Built to Spill, visit their website and Facebook page, go see their concerts, and purchase their official releases and merchandise [HERE], at Amazon, iTunes, or your favorite record store or retailer. It was a few decades ago that a friend of mine happened to spin Helmet’s landmark ‘Betty‘ album for me and set the hook for my enthusiasm for this band. Now touring to honor the 20th anniversary of this record, these dates include a front-to-back playing of it as well as a second set drawing from their vast catalog of songs. In a day and age where a number of bands are doing this, the kicker is that ‘Betty‘ is an amazing album and easily made it onto my personal list of “desert island discs” some time ago. The second of three very sold-out NYC area shows (the recording from the Saint Vitus gig is HERE) found Helmet firing on all cylinders. Frontman Page Hamilton has surrounded himself with a roster of superb musicians (drummer Kyle Stevenson, guitarist Dan Beeman and bassist Dave Case) and these concerts showcased a very well rehearsed and tight group that obviously have the chops to play anything you can throw at them. In addition to fielding a few crowd requests, Helmet dug out some deep cuts including “Impressionable”, “Repetition” and fan-favorite, “Sinatra”. In a nutshell, they sounded fantastic and more than lived up to the legacy of this material. With Helmet’s soundman, Rubes, at the board with assistance from Bowery Ballroom’s FOH, Kenny, the venue’s sound on this night was, as we’ve come to expect, great. Combining our microphones with the soundboard feed that Page asked us to use, our recording is excellent. We hope you like what you hear as much as we did. Enjoy! Special thanks to Helmet, Brian and Chad at Maine Road, and Kieran and the staff at Bowery Ballroom for making this recording possible and for their courtesy and cooperation. If you download this recording, we expect that you will PLEASE SUPPORT Helmet, visit their website and Facebook page, and purchase their official releases and merchandise [HERE] at Amazon, iTunes, or your favorite record store or retailer. And definitely go see Helmet live. For even the best of bands, there are times during their careers when they want to mix things up a bit to keep it interesting. Not only for their fans but for themselves. For more than 15 years, Lucero has never been afraid to work hard, get on the road less traveled and take some chances. On their current jaunt, billed as the “By The Seat of Our Pants Tour“, the alternative country rock/punk group from Memphis are experimenting by playing a few-nights stands in several cities (New York, Boston, Los Angeles and San Francisco), opening with acoustic sets and finishing the evenings with electric sets. With three nights here in New York alone, that makes for a lot of stage time and a lot of music. In addition to a number of songs that are regular staples in Lucero shows, it was thrilling to catch a few that we hadn’t heard in awhile and others that we’ve never heard them play live at all. Ever wanting to please, the guys dug out a sprinkling of deep and rare cuts going all the way back to their first self-released disc, ‘The Attic Tapes‘. What’s been most impressive is how well some of these pieces, already great, translate into something beautiful when stripped down and arranged acoustically. Of course, flying by the seat of your pants does include some hazards; among them, a few false starts and some indecision when fielding song requests from the crowd. But that’s just par for the course and part of the risk one takes when walking out on a tightrope without a net. When you have such an entertaining group of musicians like Lucero onstage, drawing from such a deep reservoir of tracks, you don’t really seem to mind when something doesn’t go quite as planned. And not knowing exactly what’s coming next makes it enthralling. Set up in our regular spot in the balcony at Bowery Ballroom, the venue sound was top notch as usual. Aside from some chatter during the quieter songs, our recording is excellent. We hope you like what you hear as much as we did. Enjoy! 21. What Else Would You Have Me Be? If you download this recording, we expect that you will PLEASE SUPPORT Lucero, visit their website and Facebook page, and purchase their official releases and merchandise [HERE], at Amazon and at iTunes. For Wilco, the art of arranging a setlist for the third show in three nights, in the same city, without any repeats (sans one audible-called encore) must have been challenging — but ultimately rewarding. The idea that a band can play nearly 100 songs to three-thousand people a night and still retain the same performance energy and passion is remarkable. Indeed, Thursday’s show at the Capitol Theatre was perhaps the best of the three nights in Portchester. It certainly was the show with the deepest of the deep cuts. We were happy to finally hear “Bob Dylan’s 49th Beard” for the first time live with Wilco, along with never-heard-before alternate version of Wilco’s earliest “hit” the acoustic-led “Outtamind”. Both of those tracks are streaming below. The setlist was also heavy in the Wilco/Bragg/Guthrie tracks that don’t make it out very often and several obscure tracks from all of the albums. “Candyfloss” brought us back to 2004, and “Forget the Flowers” was right out of 1997. This night’s acoustic segment was the oddest of the three, as the usually slow-to-crushingly-loud “Misunderstood” was charmingly understated, and the band’s finale was a cover sung entirely by the audience. While we prefer that Wilco sing “Ripple” themselves, the band’s sincere tribute to the history of this venue was quite well thought and ultimately effective. Our two recordings for this show were captured from the exact same excellent front left corner of the soundboard location as the previous two nights. My recording information is identical from the recording of the 29th, and for this night we have added JFCB’s excellent Milab VM-44 Cardioid pull. Both recordings are similarly superb but have unique characteristics. Enjoy! For over 30 years, Buzz “King Buzzo” Osborne and the Melvins have made their own brand of heavy rock, ‘sludge’, an institution. While that has had a huge influence on music, including helping birth the kinder, gentler ‘grunge’ genre, Melvins continue to stand apart from the crowd with a sound that is instantly recognizable. When Buzzo decided to record and release his first acoustic album this year, the excellent ‘This Machine Kills Artists‘, it was definitely a departure from what he’s known for, but not completely unexpected from a performer who has been blazing his own trail for decades. With Melvins being a favorite of ours and having appeared on this site several times, we were excited to hear that he was embarking on a solo tour in support of the new disc and relished the opportunity to catch his stop at The Wick, a new venue in the Bushwick area of Brooklyn. 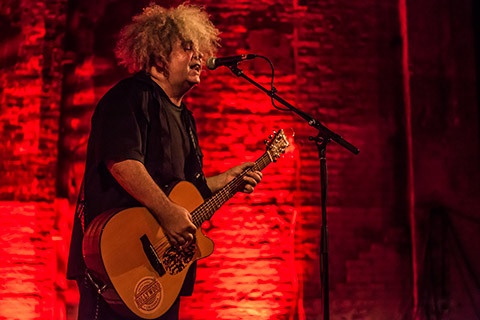 Onstage with little more than an acoustic guitar, a microphone and his trademark hair, King Buzzo kicked his set off with the dramatic “Boris” and proceeded to keep the respectful Brooklyn crowd (aside from one overly enthusiastic attendee) in rapt attention for the next 75 minutes. Peppered with anecdotes, observations and a hilarious story about Mike Patton, Buzz proved to be quite the raconteur. His great combination of new songs, Melvins staples from their vast catalog and engaging, interactive banter made for a show that I could easily enjoy almost every night. We recorded King Buzzo in the same manner as Mary Halvorson’s opening set with a stereo pair of Countryman B3 omni microphones placed onstage. While there is some ambient noise at times, the overall quality and clarity is excellent thanks to Buzzo’s sound engineer, Dave, and The Wick’s FOH, Joe. Enjoy! Special thanks to King Buzzo, Joey Massa, Chris White, John Seroff and the staff at The Wick for making this recording possible and for their courtesy and cooperation. If you download this recording, we expect that you will PLEASE SUPPORT King Buzzo and Melvins, visit their website and Facebook page, and purchase ‘This Machine Kills Artists‘ at Amazon, iTunes, or your local record store. And definitely go see Buzz and the Melvins live. Rising from the late-90’s hiatus of indie rock standard bearer Pavement, Stephen Malkmus & The Jicks picked up that flag and are still running like hell with it. Quite successfully, I might add. With a string of critically lauded albums under their belt, Malkmus and company are still the gold standard for the genre. On top of that, their live shows are spoken about in revered tones and on the must-see lists of stalwart fans. Having been a late devotee of Malkmus’ various projects, it seemed only fitting that my first Jicks concert be at the venue where they had their official live debut over a decade ago. The first of two sold out nights in the NYC-area, the band hit the stage with all cylinders firing, in great form, and with an eager crowd thrilled to hear every note. Playing the bulk of their celebrated new record, ‘Wig Out at Jagbags‘, they had plenty of room to cover songs from nearly all the previous albums, and even snuck in Pavement’s “Father to a Sister of Thought”. I’d say if there was one complaint I had by the end of the evening, it was that I hadn’t the foresight to get tickets for the following night. I guess there’s always next time. In our regular spot next to the mixing board in the balcony, we would be hard pressed to have better sound. 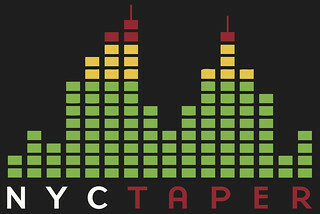 Dialed in beautifully, the mix was about as good as it gets at Bowery Ballroom and we were able to pull a wonderful recording with our microphones. Enjoy! If you download this recording, we expect that you will PLEASE SUPPORT Stephen Malkmus & The Jicks, visit their website, visit their Facebook and MySpace pages, and purchase their official releases and merchandise [HERE], at Amazon and at iTunes. That this two-hour show counts as a “short set” by Black Crowes standards says a lot about the generosity of this band. For their twenty-plus-year career, the Robinson brothers and their bandmates have gone out there and given it their all, even when their personal issues clouded the situation offstage. Even if these were the band’s “last area shows” for this year and next (according to them) I’d say it’s a certainty they’ll be back at it in 2015. This band wouldn’t still be around if these guys didn’t love to play. If the acoustic set we recorded last week was a bit longer, it also had a more languid pace than this all-business run-through that included more than its fair share of guitar pyrotechnics and uncommonly played offerings, but very little in the way of tuning pauses or stage banter. Even if the Led Zeppelin cover “Hey, Hey, What Can I Do” signaled a night that ended a bit too soon, nobody was denying how pumped they were to hear it. Similarly, the band’s cover of Stephen Stills’ “Isn’t It About Time?” had the entirety of Terminal 5 rocking. So did the one-two combo of “Hard To Handle” directly into Deep Purple’s “Hush” and a searing rendition of “Exit” from The Tall Sessions, among other moments that put this show up there with any Crowes gig I’ve seen. So don’t worry — if you missed them at any of the numerous NYC dates they just played, expect them to be back. Until then, these fine captures should tide you over. I recorded this set with Schoeps MK41 supercardiod microphones in a tight configuration from our usual spot in the venue. Johnny Fried Chicken Boy was next to me with his Milab VM-44 Links. Both recordings are on offer here and both are excellent. Enjoy! If you download this recording, we expect that you will PLEASE SUPPORT The Black Crowes, visit their website, visit their Facebook page, and purchase their official releases and merchandise [HERE], at Amazon and at iTunes. How a musician makes the transition from indie rock to big-band gypsy jazz is anyone’s guess, let alone being able to pull it off successfully. But that’s exactly what Noah Lit, the namesake of Los Angeles’ Noah and the MegaFauna, did. Rising from the ashes of his previous band, Oliver Future, Lit enlisted friends and family (brothers Joshua and Gabriel are part of the gang) to work on and produce their great 2011 debut, ‘Anthems for a Stateless Nation‘. And on their return to New York for this performance, the group played all of its tracks with its intricately appealing rhythms, notes and layers. Far more than a straight run-through of the album, this crew absolutely killed it live with an energy and tautness that comes with having a talented group of musicians that really enjoy what they’re playing, for an audience that really appreciates it. Additionally, we had the treat of a new song which we hope will appear on the band’s forthcoming record, ‘Psychopomps and Circumstance‘. On this night, we were set up just about dead-center in the terrific sounding Joe’s Pub. Our location was ideal and the results are quite excellent. We hope you like what you hear as much as we did. Enjoy! Special thanks to Noah and the MegaFauna and Joe Rogers at Silence Breaks for making this recording possible, and to the staff at Joe’s Pub for their courtesy and cooperation. Noah and the MegaFauna will soon be returning to the NYC area and performing on July 2nd at Mercury Lounge with Silence Breaks labelmate Kelli Scarr. If you download this recording, we expect that you will PLEASE SUPPORT Noah and the MegaFauna, visit their website, visit their Facebook and MySpace pages, and purchase their official releases and merchandise [HERE], at Amazon and at iTunes.